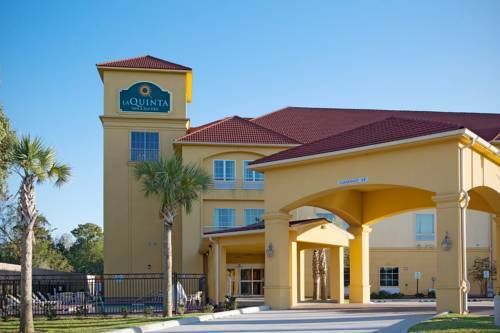 The La Quinta Inn & Suites Boutte hotel is conveniently located on Highway 90 with easy access to I-10. Only minutes from New Orleans and the Louis Armstrong New Orleans International Airport, we are also deep in the heart of Cajun country where there is a lot for you to see and experience. Whether your stay will be for business or pleasure, come experience all the comforts of home. Our friendly staff will check you into your room where you will find a comfortable bed with a pillow-top mattress and luxurious linens. Relax while watching television on our 37" flat-screen HDTV television with a variety of programming including over 30 channels in high definition. Stay in touch with friends, family or business with our free wired and wireless high-speed Internet access. After a long day, unwind in our fitness center or take a leisurely dip in our outdoor pool. After a relaxing evening, wake up and start your day off right with our free Bright Side Breakfast, featuring eggs, bacon, make your own waffles, oatmeal, Danish, assorted juices, and coffee. Our La Quinta Inn & Suites is near all major oil and gas businesses as well as some of the most graceful, old mansions as well as the inspiring nature of the swamp. The La Quinta Inn & Suites Boutte prides itself on its warm southern hospitality, and we invite you to come and experience this yourself. Guest arrivals must be guaranteed with a major credit card or advance deposit. Reservations must be cancelled by 6pm local hotel time on the day of arrival to avoid being billed one room night and tax. Exceptions may apply during Holidays and Special Events. Has exotic displays of voodoo as practiced in Haiti and Africa, along with brightly painted devil statues -- and a diminutive half-monkey half-fish "Fiji Mermaid" or merman (we had a hard time telling). Bassigator Monster and UFO Crash Site -- two of many strange exhibits in "Louisiana's most eccentric museum." Built in 1802, with an eight-foot-square interior and five chairs, which seems to be its capacity. Mass is held once a year on August 15.